Brief Personal History: John Henry is the actual titular hero from the nearly 150 year old American folk tale. Not much is known about his early life except that he was born a freeman and travelled to Virginia to work on the construction of the Chesapeake and Ohio Railway. John's natural leadership abilities and prowess as a "steel driver" led to his becoming somewhat of a leader among the other black men working along the tracks. When it was proposed that a steam powered hammer could accomplish the task of hammering steel drills into the rocks faster than men could, John took up the challenge and raced against the machine. He went on to win the race but collapsed upon victory, suffering a massive heart attack. He was mistakenly thought dead and was buried. While he slowly suffocated in a makeshift coffin, he was visited by Mother, the sentient essence of the Earth itself. Mother told him that she had witnessed his strength of body and will and the way he inspired men. She needed such an individual, for dark times were coming and she needed a champion. Mother raised John Henry up out of his grave and set him on his path, blessing him with immortality and bringing forth a hoard of gold and precious stones to help him finance his endeavors. She also endowed John with incredible physical strength and the ability to transform his body into nigh invincible molten steel. During the next 150 years John used his time and wealth well, studying at some of the world's best universities and starting hundreds of companies (most run by proxies). He became an unseen captain of industry and commerce with wealth on par with that of Rockefeller and Carnegie. In times of conflict he formed private mercenary military units and carried out special missions against the on behalf of the Allies. On one such World War II mission he and his men encountered the Axis human super-weapons Fuergott and Blackfrost. John and his men defeated them and rescued the captured scientist responsible for their creation, Dr. Eitan Greenberger. 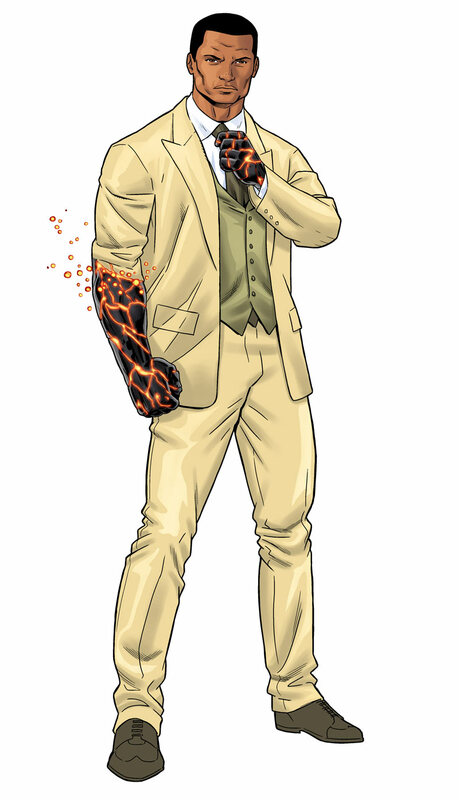 Greenberger, a pioneer in "metahuman" scientific theory, became John's best friend and staunchest ally. After World War II, Mother appeared to John. It was time for the real work to begin. Henry and Greenberger began putting together the building blocks of what would become T.A.S.K. Using John's incredible fortune they began the construction of numerous sites around the globe, stocking them with advanced technology. The most impressive of these would be The Paragon, an undersea base of operations disguised as an offshore oil platform. Greenberger, convinced that the world was on the cusp of a superhuman explosion, created a network of operatives to keep an eye out for potential metahuman activity, while he and John struggled to find a name for their organization. In 1963 the UN General Assembly of the United Nations was attacked by the re-activated Axis supermen, Fuerrgott and Blackfrost. It was then that John Henry stood revealed to the world and with the aid of Greenberger and some of his operatives, again defeated the villains. Greenberger however was mortally wounded during the battle and died in his best friend's arms handing him a note which read; "T.A.S.K. -- Tactical. Allied. Superhuman. Kommand. A 'k' works as well as a 'c' my friend.'" John then spoke at the General Assembly announcing his intention to form an international, U.N. chartered, superhuman organization dedicated to protecting the world from superhuman menace. He was met with resistance until he revealed that he singly controlled as much wealth as any global financial superpower. He was invincible and had the means to do as he wished. The U.N. agreed to recognize T.A.S.K. as an intergovernmental organization facilitating international superhuman police cooperation. John has been Executive Director of T.A.S.K. from that point to the present and has seen it grow into an organization with over 100 hundred superhuman members and satellite offices in every corner of the globe. He stands poised to guide it through its "second generation" of heroes. Powers and abilities: John Henry has the ability to transform his body into a form of constantly hardening molten steel. His external tissues become a solid metallic substance while his internal tissues transform into a substance resembling molten lava. This grants Henry incredible physical strength and resistance to injury. John Henry was made immortal by Mother, the sentient essence of the planet Earth. It is possible that the dispersal of a significant amount of his molecules would be enough to end his life, however it is doubtful that Mother allow such an event to occur until the task for which she chose him is completed. John Henry is an excellent hand to hand combatant, businessman and leader of men.